We’ve made the decision to postpone the planned start of the Early Access phase for a few weeks, the reason being the standard of quality that we’ve set as a goal for the game. Currently we’re not 100% happy with a few game aspects – concerning both the performance and gameplay bugs. We are certain that we’re able to improve these areas considerably and think a little bit of extra time is the key to creating an optimal gaming experience for you. We’re specifically working on improving frame rates concerning vegetation (grass, fruits, trees). At the same time we’re implementing our dynamic weather and clouds system, creating tutorials and of course handling the internal test phases. 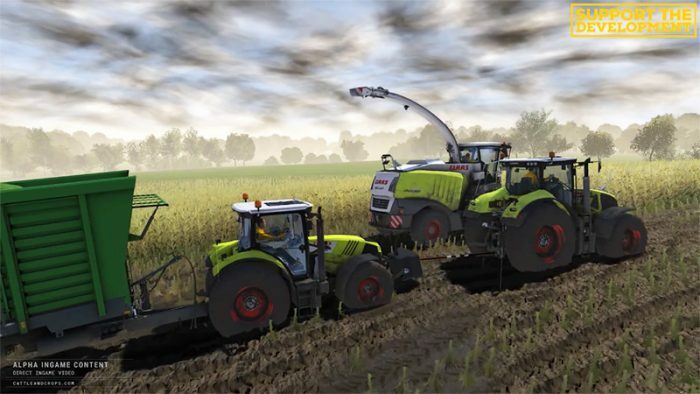 At the moment, the programming division is working on gameplay elements such as a detailed feeding and fattening system, a realistic biogas plant simulation, the implementation of UI and AI systems. Most of these areas have been completed, others still require a bit of fine tuning. Meanwhile we’ve spent the past two months fixing, adjusting and tinkering with the vehicle physics and handling and have added significant enhancements. Vehicles and equipment use virtually real data in Cattle and Crops – be it the weight, the suspension or the engine power. Simultaneously we’ve added three realism levels that will allow great driving experience for both novices and established pros. All in all we’re planning to add a few weeks to incorporating the improvements and test phases mentioned above. An exact date will be announced about two weeks before release.